Bright and wet for a very traditional tambourine sound. Calf Head: Our high quality, clear calf skin heads offer the feel and tone sought after by die hard tambourine traditionalists. Clear calf heads absorb less moisture in humid conditions than white calf heads, resulting in a more playable surface and better response when you need it most. Solid Ash Shell: The body of our SoundArt Series tambourine is manufactured with a steam bent, solid ash shell, for a full and commanding voice. The ergonomic handle design provides a comfortable grip on the instrument, and the dual sized jingle slots allow more seamless shake rolls. Hand Hammered Jingles: All SoundArt Series tambourines are custom fit with hand hammered jingles for a full and unique sound. We offer four distinct jingle types, Chromium 25™, Phosphor Bronze, German Silver and Beryllium Copper, in six different configurations for dynamic contrast and tonal versatility. 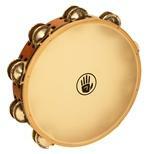 Tamborim Pele Sint10" Double Row Beryllium Copp.